Managing your home mortgage has never been easier than with the free Mortgage Loan Calculator. This free template document allows you to easily store your home mortgage information on one page. You will simply enter the items required at the top of the page and the template will take care of the rest. This free template document also displays all of your calculated payments in case you want to try different mortgage options as well. This template is made free to use, all you have to do is read the instructions below. The free Mortgage Loan template is downloadable by clicking the link at the bottom of this page. From there, just click the template file to open it. Now, at the top of the page, you will find a list of items in which to enter your mortgage information. You will list your mortgage amount, the interest rate, the duration of the loan payment, and the loan amount (if it differs from the mortgage amount). 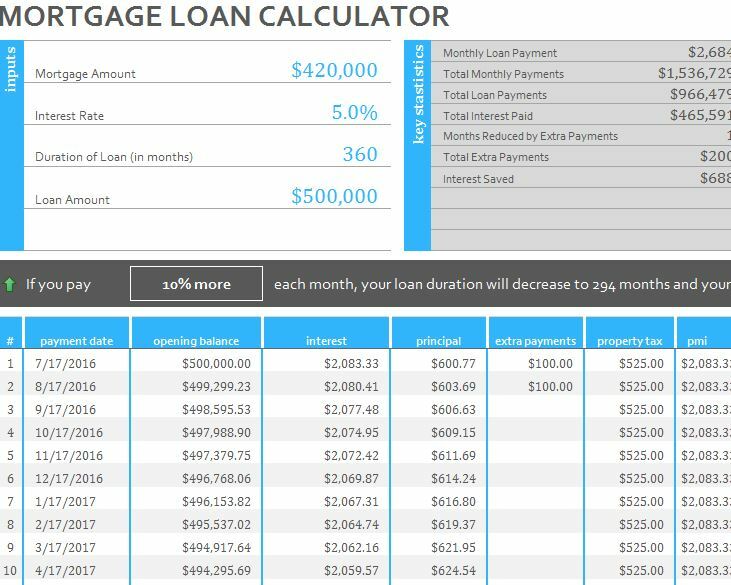 The Mortgage Loan template will then display the key statistics that you will want to know, such as your calculated monthly payments, the total number of payments you need to make, etc. If you scroll down to the bottom of the page, you can see a long list of items. This is actually all the monthly payments that you can make over time. You can adjust these to change the length of times it takes you to pay off your mortgage and so much more. You can see how easy it is to use this template as a test environment in which to see different mortgage options risk free. If you’re ready to make an educated decision about your mortgage and find the home of your dreams, then download this free template today.